RSS mouthpiece “Panchjanya” calling Jawaharlal Nehru University (JNU) home to “a huge anti-national block which has the aim of disintegrating India” has sparked off a major controversy with the Congress advising the prestigious Delhi-based university to sue the publication for defamation. However, standing by the article and its writer (Ravinder Singh Baseda), Editor of the magazine Hitesh Shankar maintains that all views expressed in the cover story and the accompanying piece are based on facts. “If apart from education, students of the university are indulging in anti-national activities, it is the job of the media and society to take cognisance. If we don’t report who will,” he asks. The cover article in the publication supported by the BJP’s parent organisation RSS claims that “JNU routinely hosts anti-national activities”. An accompanying article alleges that JNU is an institute where “nationalism is considered an offence”. “Presenting Indian culture in a distorted way is common. Removal of the Army from Kashmir is supported here. They advocate various other anti-national activities here,” says the article in Panchjanjya, while also accusing the university of providing “legitimacy to anti-India forces”. The writer claims that while studying at JNU between 2010 and 2015, he witnessed many “anti-society” and “anti-national” activities. He also alleges that he often heard JNU professors “discuss ways to undermine national unity and culture” at events organised by anti-national organisations. 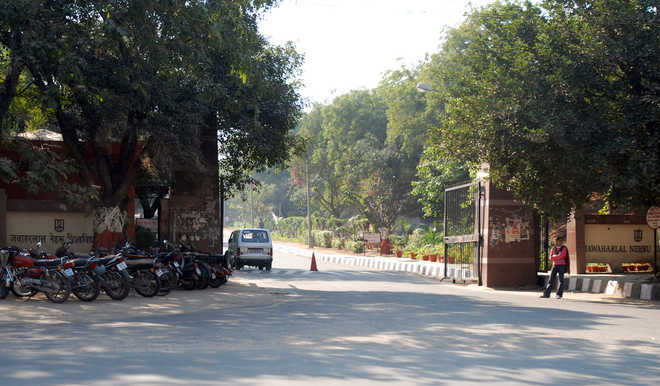 “I then realised that JNU is home to a large chunk of anti-national groupings which have the singular aim of disintegrating India,” says the writer, who goes on to explain other “such happenings” on the campus.